Home > Attorney Work Product > View From Proskauer: ERISA Plan Fiduciaries—Are Your Conversations With Counsel Privileged? 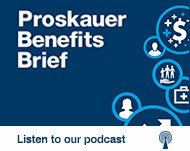 View From Proskauer: ERISA Plan Fiduciaries—Are Your Conversations With Counsel Privileged? It is generally understood that communications between clients and lawyers are privileged and that the substance of those conversations may not be divulged to third parties except in the rarest of circumstances. In the employee benefits world, however, plan sponsors and fiduciaries are often surprised to learn that this cardinal rule does not always apply. In fact, many communications between plan fiduciaries and plan counsel must be divulged to plan participants and beneficiaries. The reason for different treatment of the attorney-client privilege in employee benefits matters is the so-called “fiduciary exception,” pursuant to which communications between an attorney and a plan fiduciary are not shielded from disclosure to plan participants. There are two explanations for the exception: first, because the participants, rather than the plan fiduciaries, are viewed as the “real” clients of plan counsel; and second, because plan participants are entitled to disclosure of all information pertaining to the administration of their claims for benefits. While the fiduciary exception doctrine is well established, its application may differ depending on the particular facts and circumstances presented. This article highlights ten principles that generally are determinative of whether the exception will apply. Identify the Client. In order to evaluate whether the fiduciary exception is applicable, one must first identify the client with whom the attorney was communicating. There are several potential clients, including the plan, a plan fiduciary, a plan administrator or a plan sponsor, which in the multiemployer context could include a contributing employer or a union. The fiduciary exception applies—if at all—only in cases of attorney communications with plan fiduciaries. Nature and Purpose of the Communication. The reasoning behind the fiduciary exception, at least in part, is that plan fiduciaries have a duty to make information regarding the administration of a plan available to a plan’s participants and beneficiaries. As part of this obligation, fiduciaries must make available upon request communications with plan counsel that are intended to assist in the administration of the plan. Whether a communication concerns the administration of a plan is often a fact-intensive inquiry made by a court in camera. Limits to the Fiduciary Exception. Courts have recognized that there are circumstances where the fiduciary exception is inapplicable. For instance, it has no application where the advice relates to a settlor function, e.g., issues pertaining to adoption, amendment and termination of a plan amendment. Similarly, where the goal of the advice is to advise the fiduciary of his or her potential personal liability, the fiduciary exception does not apply. Joint Representation. A plan fiduciary cannot preclude the application of the fiduciary exception to the attorney-client privilege where it is otherwise applicable merely by retaining the same counsel that advises the plan sponsor. In other words, if a lawyer is retained to advise an employer to provide advice in his capacities as both a nonfiduciary and as a plan fiduciary, consultation on the nonfiduciary matters will not prevent disclosure of privileged communications on the fiduciary matters. Participant Claims and Appeals. Although a participant’s administrative claim or appeal is necessarily adversarial in nature, i.e., a participant generally demands benefits or additional benefits that she believes she is entitled to under the terms of the plan, courts have concluded that the fiduciary exception applies to communications between plan fiduciaries and counsel concerning such claims and appeals provided that the communications occur prior to the time the administrative process is fully exhausted. One rationale for this conclusion is that under Department of Labor regulations, a claimant who has had her claim denied must be allowed access to all documents and information “relevant” to the claim. Post-decisional communications, where a plan seeks legal advice after the decision to deny an appeal, are no longer relevant to the decision-making process and constitute evidence that the interests of the beneficiary and the plan fiduciary have diverged. Good Cause Requirement. Early in the development of the fiduciary exception, some courts required a participant to demonstrate good cause before applying the fiduciary exception. The requirement derives from the showing that a shareholder must make in a derivative action to obtain discovery from management. The few courts that have required a showing of good cause in the Employee Retirement Income Security Act context appear to be seeking a balance between the fiduciary’s interest in confidentiality and the participant’s need for the information in question. Most courts have either expressly rejected the need to show good cause, or simply have not addressed the issue. Application to DOL Proceedings. Where the DOL commences an investigation or a lawsuit on behalf of participants and beneficiaries, courts have concluded that the agency steps into the shoes of the participants and beneficiaries and may invoke the fiduciary exception. Application to Insurance Companies. There is a split of authorities regarding the application of the fiduciary exception to insurance companies. The Third Circuit concluded that the fiduciary exception does not apply to a health plan insurer because the plan beneficiaries were not the “real” clients obtaining legal representation. The court reached this conclusion because: (i) legal title to the assets remained with the insurer; (ii) a conflict of interest exists when an insurance company determines eligibility for benefits and pays those benefits from its own funds; (iii) insurers have interests larger and distinct from any one plan’s beneficiaries insofar as they handle multiple ERISA benefit plans at once; and (iv) insurers paid for legal advice using their own assets, not those of their beneficiaries. The Ninth Circuit, on the other hand, found that the fiduciary exception is applicable to insurers. The court reasoned that the fiduciary exception applied equally to both trustees who serve as fiduciaries of a plan and insurers acting in the role of fiduciaries, since both maintain the same legal duties as fiduciaries under ERISA and there is no meaningful distinction between them. Waiver. The attorney-client privilege can be waived if the communication occurs in the presence of a third party. In the employee benefits world, meetings about plan issues often address a multitude of issues, such as plan investments, ongoing compliance and benefit claims and appeals. These meetings are often attended by various service providers, including the plan fiduciaries, counsel, investment consultants, actuaries and accountants. Careful consideration should be given to whether the presence of service providers is necessary to the discussion at hand. If it is not, any privilege that may have existed concerning a conversation between the plan fiduciaries and counsel could be deemed to have been waived. Attorney Work Product. The work product doctrine protects attorney communications, thought processes and other activities conducted in anticipation of litigation. Courts have concluded that the fiduciary exception generally has no application to the work product doctrine because the work product belongs exclusively to the attorney. However, courts have ruled that communications between plan fiduciaries and the plan’s attorney during the administrative process are not shielded from disclosure under the fiduciary exception, even if they may appear to be made in anticipation of litigation. While ethical issues arise across all disciplines, they are particularly prevalent in the employee benefits practice because of the multiple parties involved and the multiple “hats” that individuals may wear. The fiduciary exception to the attorney-client privilege adds yet another layer of complication. Plan fiduciaries should be mindful of the principles outlined above when engaged in communications with their attorneys, so that they avoid being surprised—and potentially disadvantaged—if these communications one day become the subject of litigation. See, e.g., U.S. v. Mett, 178 F.3d 1058, 1063 [23 EBC 1081] (9th Cir. 1999) (26 BPR 1545, 6/7/99) (“As applied in the ERISA context, the fiduciary exception provides that ‘an employer acting in the capacity of ERISA fiduciary is disabled from asserting the attorney-client privilege against plan beneficiaries on matters of plan administration.’”) (citation omitted). See, e.g., Bland v. Fiatallis North America, 401 F.3d 779, 787-88 [34 EBC 1875] (7th Cir. 2005) (51 PBD, 3/17/05; 32 BPR 681, 3/22/05). See, e.g., U.S. v. Mett, 178 F.3d at 1065 (holding that the fiduciary exception did not apply to legal memoranda advising defendants, as plan trustees, about their personal, civil and criminal exposure). See, e.g., In re Long Island Lighting Co., 129 F.3d 268, 272 [21 EBC 2025] (2d Cir. 1997). See, e.g., Gunderson v. MetLife Ins. Co., No. 10-CV-50, 2011 WL 487755, at *10-11 (D. Utah Feb. 7, 2011). See, e.g., Neathery v. Chevron Texaco Corp. Group Acc. Policy No. OK826458, No. 05 Civ. 1883, 2006 WL 4690828, at *2 (S.D. Cal. July 11, 2006). See In re Occidental, 217 F.3d 293, 297 (5th Cir. 2000); Donovan v. Fitzsimmons, 90 F.R.D. 583, 586-87 (N.D. Ill. 1981) (144 PBD, 7/26/00; 27 BPR 1828, 8/1/00). See, e.g., Solis v. The Food Employers Labor Relations Assoc., 644 F.3d 221, 229-31 [50 EBC 2697] (4th Cir. 2011) (88 PBD, 5/6/11; 38 BPR 910, 5/10/11) (“there was no principled basis on which to distinguish between enforcement actions and investigations in the application of the fiduciary exception”). Wachtel v. Healthnet, Inc., 482 F.3d 225 [40 EBC 1545] (3d Cir. 2007) (63 PBD, 4/3/07; 34 BPR 856, 4/10/07). Stephan v. Unum Insurance Co. of Amer., 697 F.3d 917 [54 EBC 1887] (9th Cir. 2012) (177 PBD, 9/13/12; 39 BPR 1767, 9/18/12). See, e.g., Hill v. State Street Corp., 2013 U.S. Dist. LEXIS 181168, at 17-19 (D. Mass. Dec. 30, 2013). See, e.g., Wildbur v. Arco Chemical, 974 F.2d 631, 646 [16 EBC 1235] (5th Cir. 1992) (“Because the attorney work product doctrine fosters interests different from the attorney-client privilege, it may be successfully invoked against a pension plan beneficiary even though the attorney-client privilege is unavailable.”).